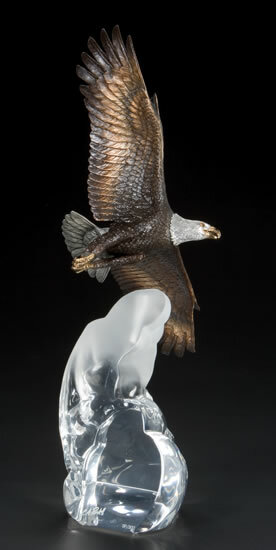 This majestic eagle flies proudly over a Lucite cloud,	soaring to unlimited heights. For more than forty years, California-based Starlite Originals has been working with exceptional contemporary 3-D artists to bring their innovative, artistic creations to life. Starlite has revolutionized the world of Mixed Media sculpture by combining metals such as lost wax bronze, fine pewter, 24 karat gold vermeil, copper and brass with optically clear Lucite to add amazing dimension, color and texture. The quality and craftsmanship is simply unmatched. Depending on the artist's vision, Starlite sculptures can be made of a variety of quality materials, including bronze, pewter, gold vermeil and Lucite. Each piece begins from an original made of plasticine clay which is then used to create first generations models. The sculpture is then sectioned into any number of component parts which are cast in the designated material and used to mold individual cavities. In the simplest terms it means that a variety of materials are used in one sculpture. Starlite's artisans are experts at creating optically breathtaking works of art by combining many fine metals such as lost wax bronze, fine pewter, brass, copper, 24 karat gold vermeil. Various hot torched acid patina highlights may be used such as black nickel, rose copper, and turquoise. In many instances, the sculpture will be encased in brilliant, crystal-clear Lucite with stunning effect. The artist creates the original piece from plasticine clay and then delivers it to the foundry where working models are made by Starlite's master mold makers. Using time-honored Old World techniques, the master mold is then created. Once perfected, molten metal is poured into the cavities in the mold and left to cool to room temperature. Each part is then removed from the mold, cleaned, assembled, and hand tooled until it looks exactly as the artist created it. The sculpture then goes through numerous metal plating and patina application steps, completing the Mixed Media process. Patina is definitely not paint. A patina highlight or finish is created by the careful application of certain chemicals which oxidize the metal during the hot-torching process. When the chemicals are heated, it etches into the metal, producing a rainbow of color finishes. The color produced by the patina becomes one with the metal itself, not painted on top as it would be with paint.h3>What Is Lucite? It is a transparent, crystal clear, hand-crafted material that can be formed into any desired shape and used with stunning effect. It may be polished to produce the clearest finish or frosted to create a milky white opaque finish, allowing for a variety of artistic choices. It is also UV resistant. Yes! Simply submit your order and note the number you would like to receive in the Additional Comments section at checkout. If it is available (i.e., not yet sold or shipped to someone else), we will ship that number to you. If that number is not available we will ship you the lowest available number in the series. Feel free to contact an AllSculptures.com Representative if you have additional questions. When new molds are used, an artist will personally inspect and approve the first-run pieces. These sculptures are then used as working masters, against which the craftsmen will compare subsequent runs. Typically the number of Artist Proofs (AP) available will be 10-15% of the regular limited edition size. Since they are more scarce, they tend to be considered more valuable by collectors and usually cost about 25% more. They are numbered in the following format : 13/50AP (for example). This would signify #13 of the 50 artist proofs available. You can purchase Artist Proofs through AllSculptures.com; please contact us for details and availability. Each person who purchases a Starlite limited edition sculpture through AllSculptures.com is invited to register their sculpture with the Starlite Society. Each sculpture will come with a certificate request card which should be completed and returned to Starlite. The Starlite Society will then send the collector a personalized certificate of ownership and will keep them informed with important updates and the latest news throughout the year. All registered sculptures are kept in a database at Starlite for insurance and appraisal purposes. 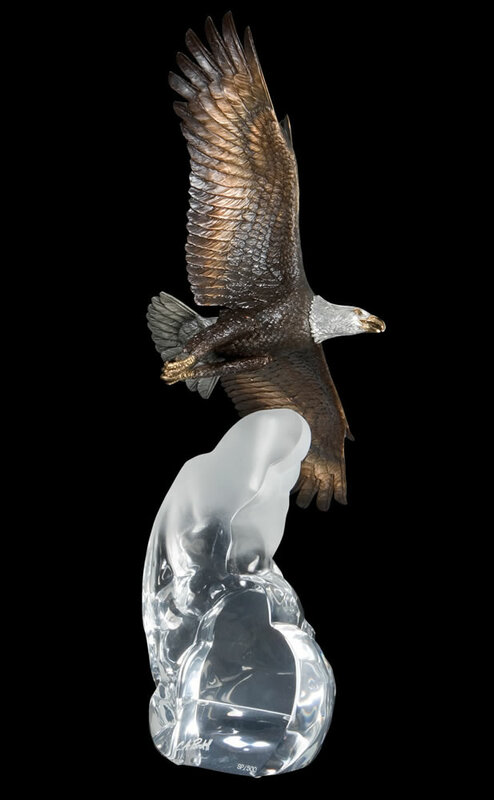 Whether you are looking to honor a loyal employee, to commemorate an important milestone, or to award your top performers, a beautifully crafted limited edition sculpture is the perfect choice. We can customize this piece with your logo or create a one of a kind limited edition piece for your organization. Contact an AllSculptures.com Representative to discuss available options.